The balloon once played a huge part in wedding and party decor. I have fond memories of laughing like a chipmunk as I sucked on the helium, rubbing balloons on my head to make my hair go static and the feel of nearly having a heart attack at the sound of a balloon popping nearby. Unfortunately over the years balloons became notorious for being a bit tacky and cheap and I will admit I was one of those people that had pretty much written off the common balloon. Since then balloons have undergone a radical makeover, they have come back, bigger, brighter and bolder and I’m not afraid to say, I LOVE THEM!! There are so many ways you can use balloons at your wedding although today we will be concentrating on those of the very large variety with a little help from Paula of The Giant Balloon Company. 1. Add Some Colour. One fun way of bringing a colour scheme to life or brightening up a neutral colour scheme is to add pops of colour with brightly coloured balloons. We recently did a shoot where we did exactly that and we were amazed at how much life the balloons injected into the theme! You needn’t go all out as we did and have balloons all colours of the rainbow, you could just choose one or two colours and this will inject lots of fun into your theme. 2. Create Cute Shots. Balloons are fabulous props when taking photos, whether just holding them or hiding behind them there is no denying balloons can transform a shot from dull to quirky in a matter of seconds. I personally think balloons are great props especially if the thought of having your photo taken makes you nervous, using a balloon as an aid does wonders for taking your mind off being photographed. 3. Fun for the Little Ones. You will be hard pushed to find a kid who is fascinated by balloons so they make great entertainment for the kids and they can even take them home with them afterwards. Actually who said balloons were just for kids, I have been know to take many a balloon home after a party! 4. Beautiful Backdrops. Remember the balloon arch? Well that too has now been replaced with something bigger and better. 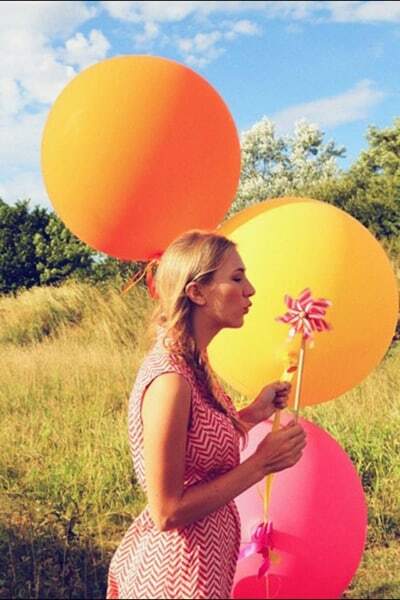 Grouping balloons together in masses has a striking effect and is great for photo booths and decor! 5. That DIY touch. If you are a bride looking to DIY every part of her wedding then a giant balloon is extremely easy to add too. Create your own tassels, confetti garlands or even stick on mini pom poms like we did in this tutorial. Alternatively speak to your balloon providers as in many cases they would be happy to supply you with added extras, to get the same effect. I couldn’t leave without telling you that all the balloons you see in this post are provided by The Giant Balloon Company. We have had the pleasure of working with owner Paula many times and I couldn’t recommend her high enough for all your balloon needs! You can find her on Facebook, Twitter, Instagram & Pinterest or alternatively email Paula at the giantballoonco@gmail.com. I know its lame but it had me in stitches – simple things!! !